Things start to heat up for the real Morgan, who is still chained up at the moment, as his captor knows the prize he has with him and doubly so with the little boy Tinder in his care whom he figures out to be Morgan’s son. That is more than Morgan knows at the moment, though he is glad of Tinder’s company, the boy having braved to break the rules and speak to the man. 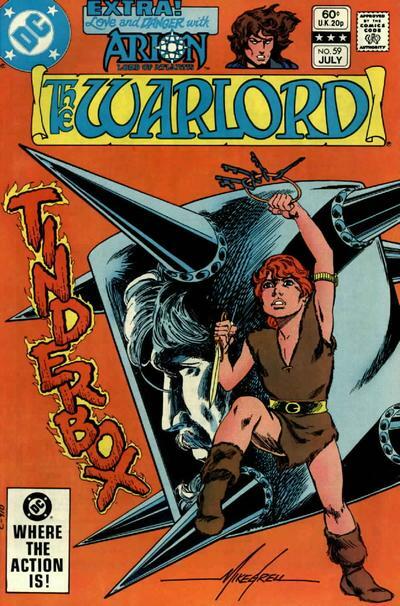 Mike Grell returns to write and draw this issue, having stepped away from pencilling duties the last number of books. It looks as if there will be a meeting between Morgan and his long-believed-to-be-dead son, a story that has been in the making for a long, long time. There are all sorts of people involved in the kidnapping of Travis Morgan and they all want one thing or another from the man. His jailor realizes that he holds the keys to a fortune while the noblemen at court who had arranged it and the actor to take his place, now want the man dead instead of just rotting in a dungeon. Whatever the case, Morgan is in a lot of danger and his rescue all falls to his young son Joshua, or Tinder as he is known here. Grell’s pencils look as good as they ever have, and it is interesting to see him actually draw something that does not involve strange creatures or men in pitched battle. Here, it is simply a battle of conflicting plans between men that desire different things. Once more, there is a backup story, still featuring Arion, the Lord of Atlantis, but also one that prohibits this book from telling a full-length tale.